Arab terrorist runs over Border Police officer before being neutralized near Halhoul in Hevron region. An Arab terrorist launched a car attack on Wednesday afternoon, critically wounding a young Border Police officer. The terrorist was eliminated in the incident, which took place near the Arab town of Halhoul in the Hevron region of Judea. The attacker, later identified as a 23-year-old resident of Hevron, was shot dead by security forces who responded to the incident. 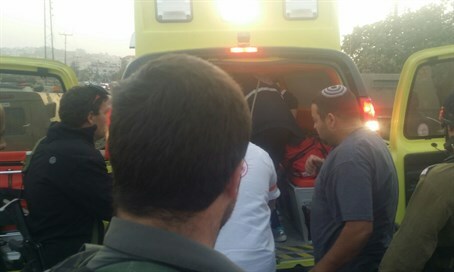 Magen David Adom (MDA) medical teams began providing the wounded officer with medical treatment at the scene. The victim, aged in his early 20s, was evacuated to Hadassah Ein Kerem Hospital in Jerusalem while on artificial respiration and put under with anesthetics. The hospital reported that the officer suffered from wounds to his head, and that his life is in danger from the severity of his wounds.